This is the Oxford Preservation Trust’s annual Oxford Open Doors weekend and St Clement’s is open for curious visitors tomorrow afternoon. This morning I have been helping mount a display and this is one the gems that has come to light, an architects drawing from 1825. At that time, the old church situated on The Plain (just across Magdalen Bridge from central Oxford) was decided to be too small to cope with a growing parish, not to mention too close to the main road. 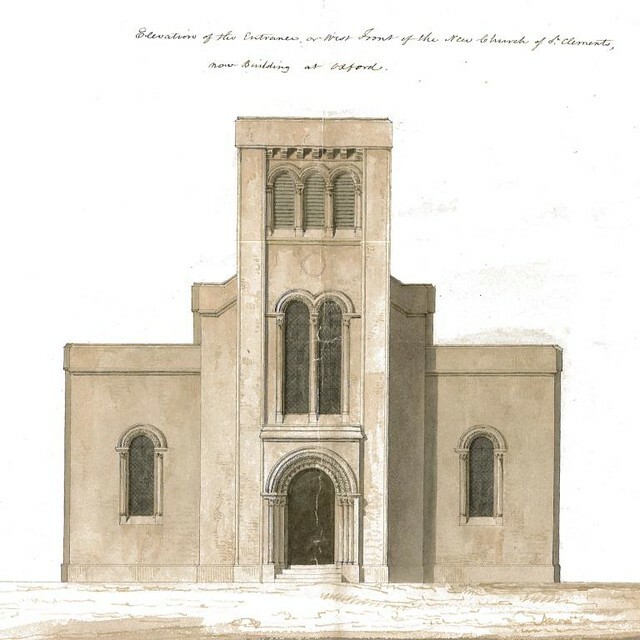 A project was set up, headed by the curate (John Henry Newman, who later became famous for other things), and in 1828 the new building was opened its present site on Marston Road opposite Headington Hill park. The development of the area did not proceed quite as expected and so the church remains rather set back from the main road and on the edge of the inhabited section of the parish. Originally, it was expected that there would be a network of streets and a public square in the area then known as Hackney Croft. However, the building was very close to what was shown in this drawing and has been given a Grade II* listing as an important example of neo-romanesque architecture (original romanesque work, from the 11th century, can be seen at St Mary’s, Iffley and a little at St Andrew’s, Old Headington). If you are in the area, the church will be open from 2pm – 6pm. We are also open for the curious every week at 10:30am and 6:30pm for regular services but those aren’t so much times for wandering round drinking in the architecture (although you can after the service finishes) and the display will only be up for a week or two (with plans afoot for a WWI themed display in November this year).